Located in Riviere Du Rempart, Mauritius, the Chateau de Labourdonnais is a 540-hectare historic estate featuring a living history home museum, tours of a food processing factory and distillery, and several fine dining restaurants. The Republic of Mauritius is a 2,040-square-kilometer island country in the Indian Ocean, located approximately 2,000 kilometers off the southeastern coast of Africa. Though archaeological evidence indicates that the island was visited frequently by ancient sailors, its first recorded modern visit was in 1502, when it was named Dina Arobi by Arabian sailors. After occupation as a Dutch settlement in the 17th century, the island fell under French control in 1715 and became a major hub for the French East India Company and a major center of slave trade activity. After the island was ceded to British forces in 1810, the 1814 Treaty of Paris was ratified to ensure significant human rights and cultural freedoms for the island’s citizens. The island’s economy was centered around the sugar cane industry throughout much of the 19th century, though much economic activity shifted to tourism in the 20th century, particularly following the island’s declaration of independence in 1968. Today, the Republic of Mauritius encompasses the main island of Mauritius and the nearby island of Rodrigues, along with several smaller outer islands, including the disputed Chagos Archipelago and Seychelles territories. The country is a member of the Commonwealth of Nations and is known as a major center of multiculturality and democracy within the African Union. Its largest city, Port Louis, is one of the most prominent ports and financial centers in Africa and offers a variety of cultural attractions such as the Jardin de la Compagnie public gardens, the Caudan Waterfront district, and the Champs de Mars racecourse. The Domaine de Labourdonnais private estate was established on the island in 1774, though its estate house, Château de Labourdonnais, was not constructed until 1856 by Christian Wiehe. The 540-hectare estate served as a prominent sugar cane plantation throughout much of the 19th century. In the mid-20th century, the estate embarked on crop diversification efforts and began producing a variety of fruits and vegetables for distribution and food processing of jams, jellies, and other goods. 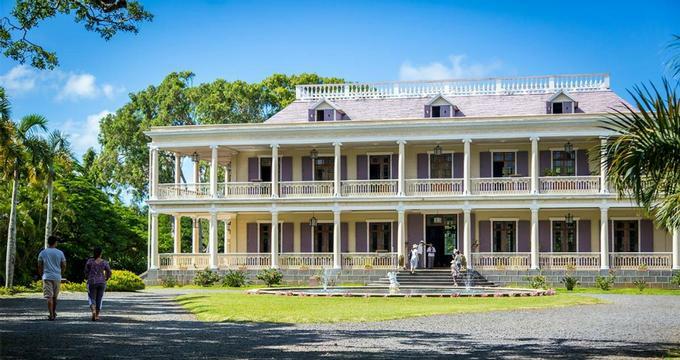 The estate’s grand mansion was restored in the late 2000s and opened to the public as a living history museum, showcasing the splendor of the Victorian era in Mauritian history. Today, the Château de Labourdonnais serves as one of the island country’s most prominent cultural attractions and offers visitors the chance to step back into the region’s 19th-century Victorian heritage. The home has been the residence of the Wiehe family for more than 150 years and is open to the public as a living history museum facility for daily self-guided tours during the morning and afternoon hours, with ticket rates offered for adults, children, and seniors. The lavish home has been restored to its original colonial architecture and condition by the Compagnie Agricole de Labourdonnais, with the help of French museologist Claude Fauque and scenographer Alexandre Fruh. Visitors may tour the home’s elaborate grounds, which feature a large garden area, circular fountain, and several sculpted figures. Notable rooms within the home include its verandah area and its master bedroom suite, furnished by Wiehe’s wife, Emile Bourgault du Coudray. A screening room on the home’s upper floor features documentary and photograph viewing stations with personal headphones, offering more information on the home’s architecture, construction, and history. In addition to the historic home, the Domaine de Labourdonnais offers a number of visitor attractions, including a Tasting Bar, which offers complimentary samples of the estate’s line of jams, fruit jellies, and juices. Since 1995, the estate has been producing its exclusive Les Vergers de Labourdonnais line of fruit-based food products, including fruit candies, chili pastes, sorbets, and marmalades. Tastings of rums produced by the estate’s Rhumerie des Mascareignes distillery are also offered as part of tour tickets for adult visitors. Several restaurants are offered on the estate’s campus, including the fine dining establishment La Table du Château, which seats 75 and is operated by head chef Fabio de Poli, and the breakfast and lunch cafe La Terrasse, which serves traditional Mauritian dishes and tea fare. The La Corbeille delicatessen stocks products from the Les Vergers de Labourdonnais line along with a wide range of organic produce, fresh breads, and wines. A Château Gift Shop also offers a variety of souvenirs and exclusive items. In addition to standard visitor admission, a variety of group tour packages are offered for small groups and organizations, including a blind tasting session workshop, a fruit-infused cane rum crafting workshop, and a sorbet tasting activity. Tours may also be customized for group needs by contacting the facility directly. 45-minute guided tours of the estate are offered aboard the Labourdonnais Express tram, which seats up to 15 adults or 20 children. Several facilities at the Château may be rented for private special events, including the La Table du Château restaurant and the Espace Ernest Wiehe Conference Room.